With the Spring season at Joe’s Valley in full effect lately, Joe’s best known hard problem has been receiving a fair amount of attention lately with Jamie Emerson working it and Matt Wilder sending. 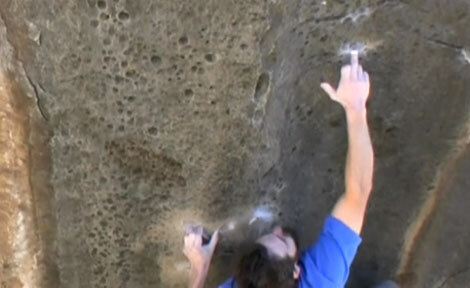 The problem is, of course, Black Lung (V13). First climbed by the legendary Ben Moon during a roadtrip to the U.S. back in 2000, Black Lung is a sought after tick for anyone able to climb at that grade. What that grade actually is seems to be up for debate as a quick perusal of 8a.nu reveals a few people registering it as V12 as well as comments about new beta making it easier. For me short = less time to screw things up. I think “pure” would have been a better choice of words maybe. You probably also spend a significant amount of time in Yosemite, a place that is littered with very tall proud lines. Most of us don’t even know what climbing problems such as those found in the Valley are like! In response, I would explain it in the same terms used by my (California’s) Governator when discussing what lifting weights is like in the movie Pumping Iron. If you haven’t seen it, you should. If you haven’t bouldered in Yosemite…well, there aren’t any boulders there. THEN you turn around and glance at el captain, and get a good lesson in how things are relative.